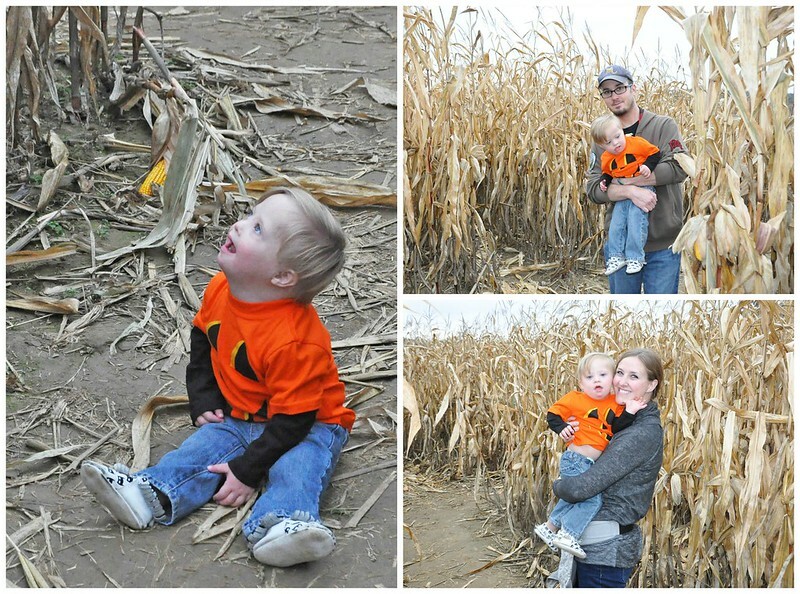 While going through Halloween pictures this past week, it hit me that we've been taking kids Trick or Treating for an entire decade. A DECADE. How is that even possible?!? Time flies when you're having fun, right? I guess having 4 kids in an 8 year span will make time fly by, too. It feels like I just had my first baby. That first baby is turning 11 in a few weeks and my actual baby is already 2! 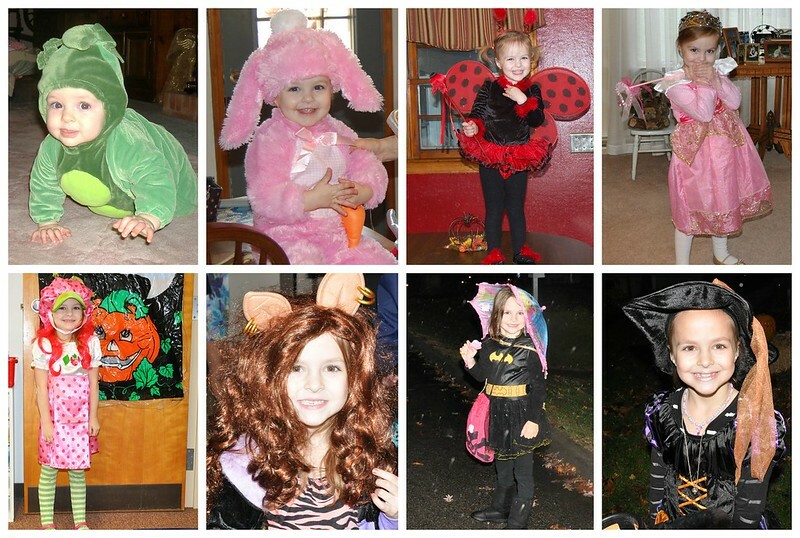 And THAT'S how a decade of Trick or Treating passes by in the blink of an eye. 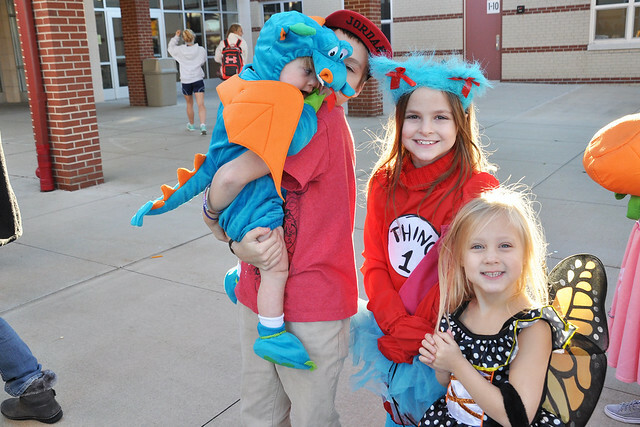 My kids love Halloween, and they love to choose their own costumes. Once they have their own opinions, their costume choice is up to them. As much as I would love to do a theme, it's not fair for me to make them wear something they don't want to. 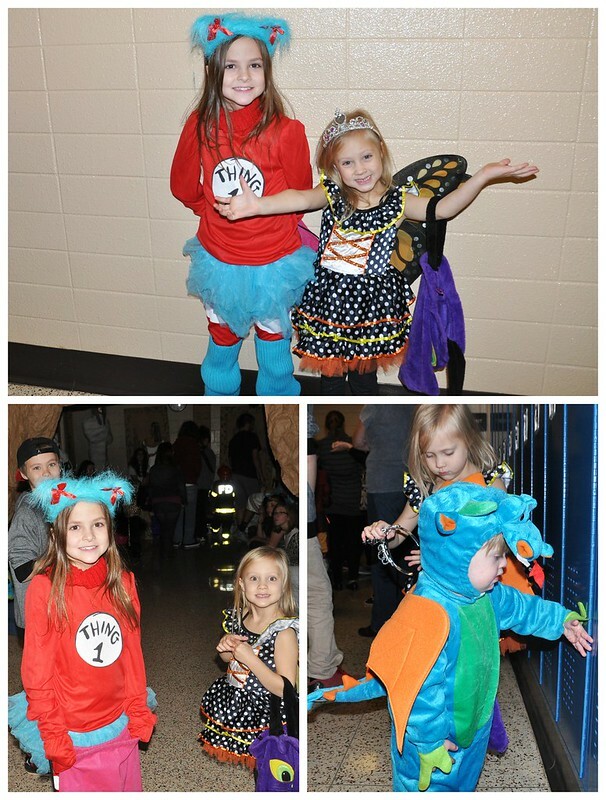 Instead, I embrace their choices (and often poor quality store bought costumes) and enjoy watching them smile! 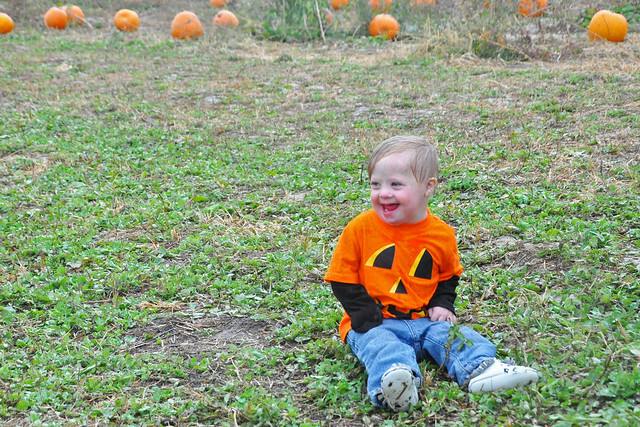 The magic of Halloween is fleeting, so I'll do anything to see those smiles. Trust me. 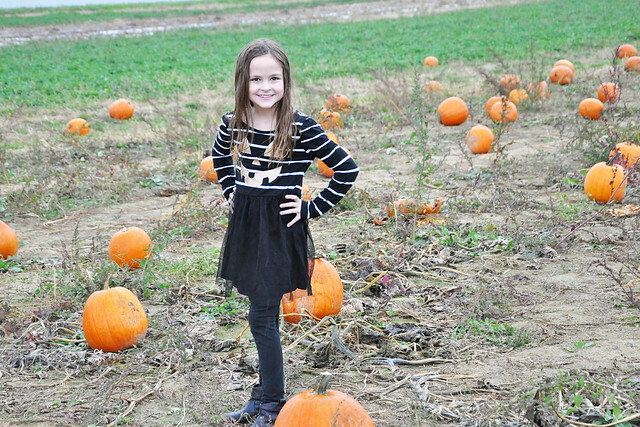 Trick or Treating will all too soon be a thing of the past for my tween. Yep. The skunk was, by far, my favorite!!! 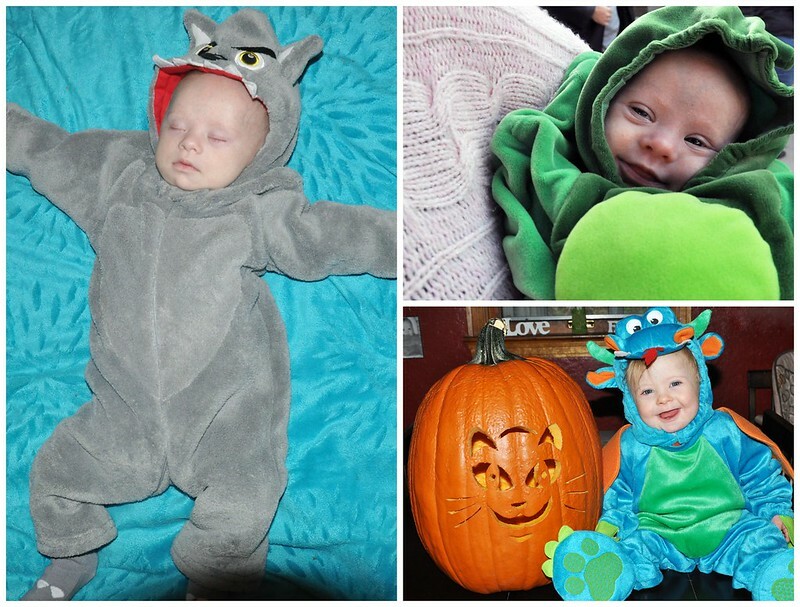 The pea pod was awesome, but I adored her bunny costume! 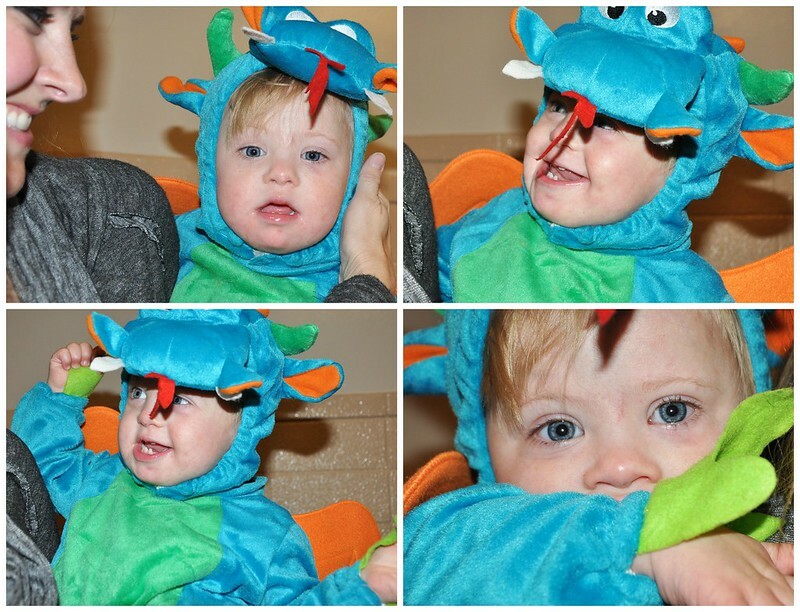 The pea pod made a comeback for Lily's first Halloween! I was a big fan of the poodle costume, though. She actually won a costume contest wearing it the following year! 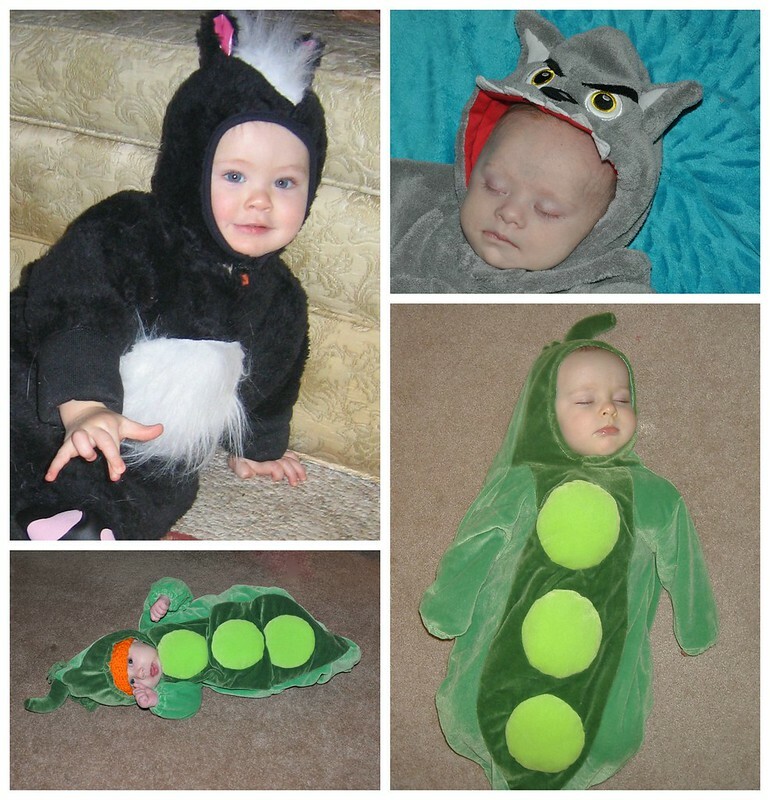 Liam was the Not-So-Big-Bad-Wolf for his first Halloween, but he wore the pea pod costume for a few other Trick or Treating events that year! 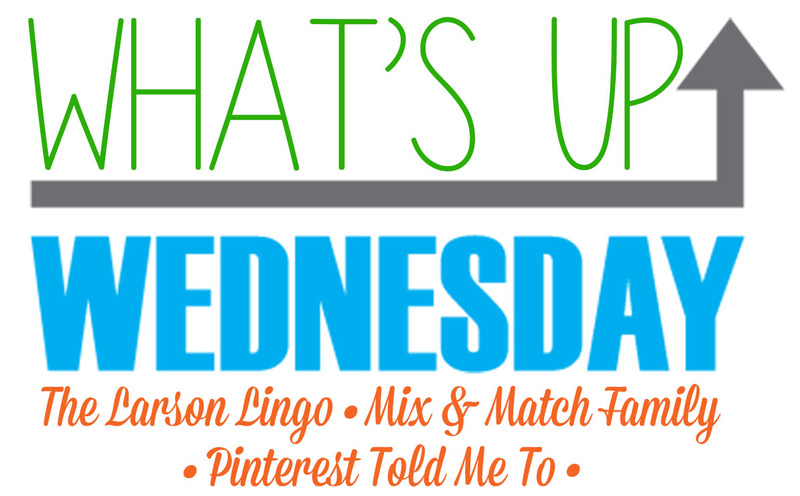 I'm in the midst of finalizing plans for two class Halloween parties this week (while chasing a toddler), but decided to take a break from all the planning to link up with The Larson Lingo for What's Up Wednesday! 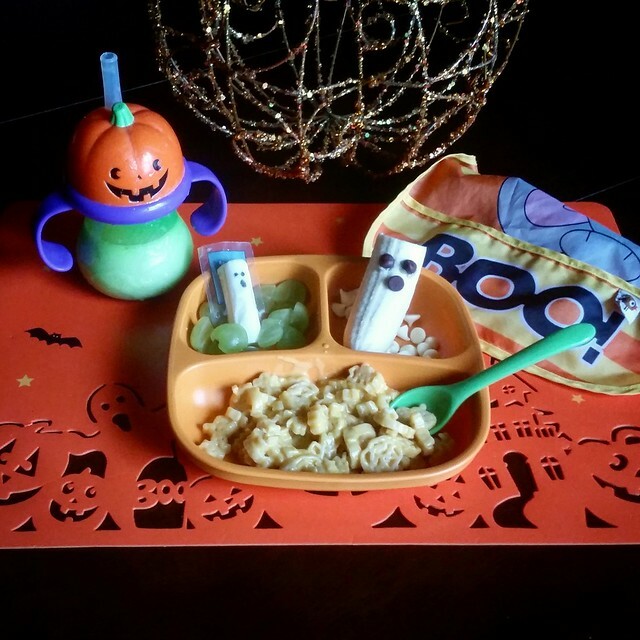 Lots of Halloween meals and treats! Halloween in the past. 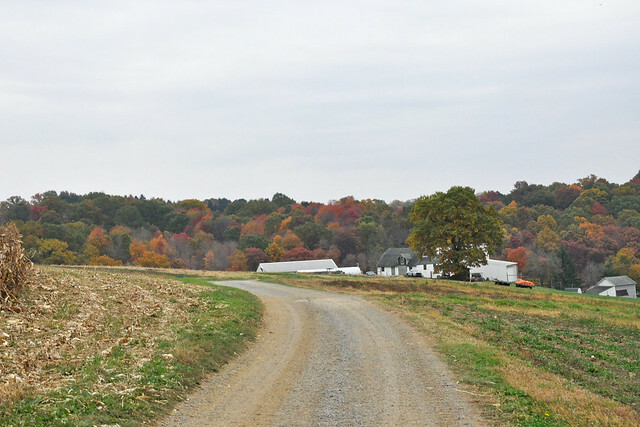 I'm working on a post, and going through old pictures. My babies are growing up way too fast!!! 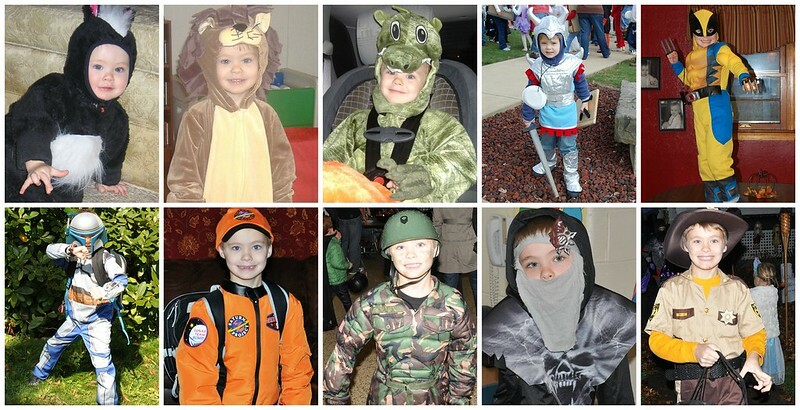 Dylan's first Halloween was an entire decade ago. Excuse me while I go cry. Liam's November Rep package arrived from Anchored Arrow & Co! 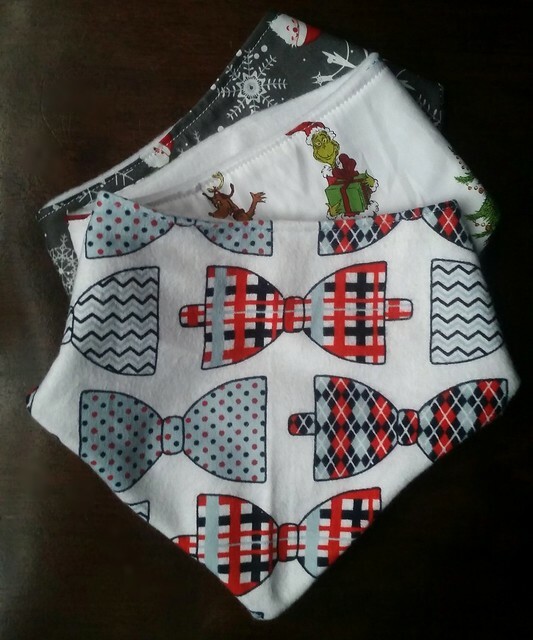 I swear, the bow tie bandana bib was made JUST for him! 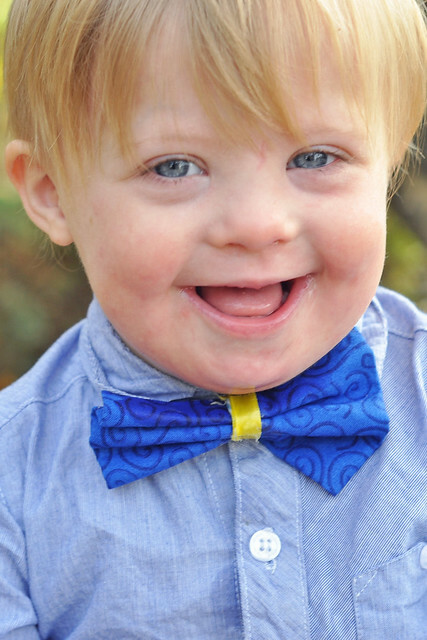 I love taking pictures of Liam every afternoon to share for Down Syndrome Awareness Month. 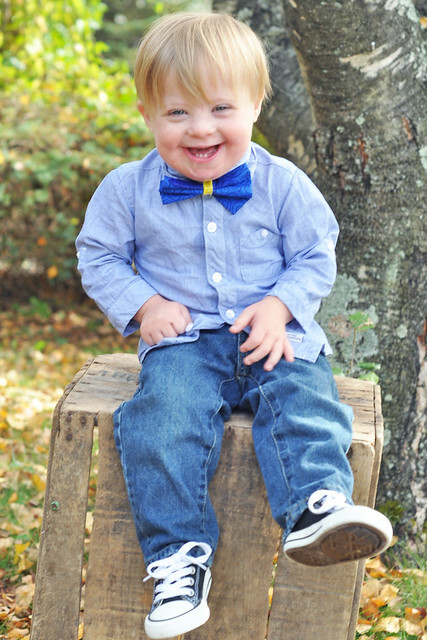 This little boy rocks his mini photoshoots. 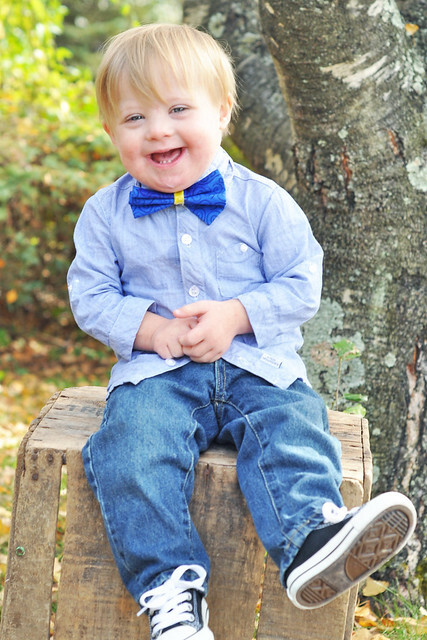 He's such a blessing! 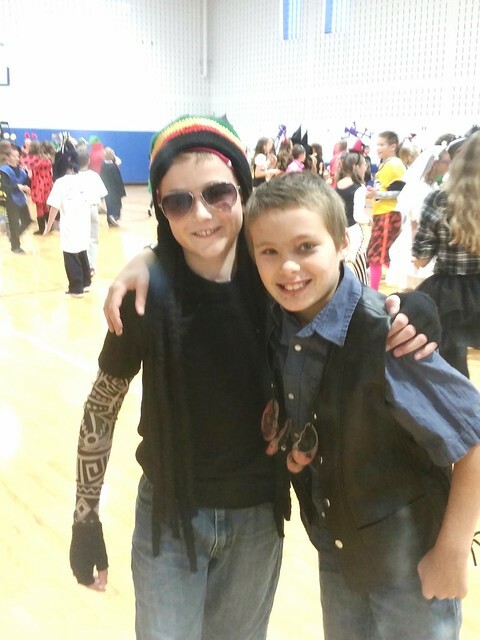 Last Friday, I volunteered at Dylan's 5th grade Halloween party. It was for the entire grade. It's a big change from class parties! 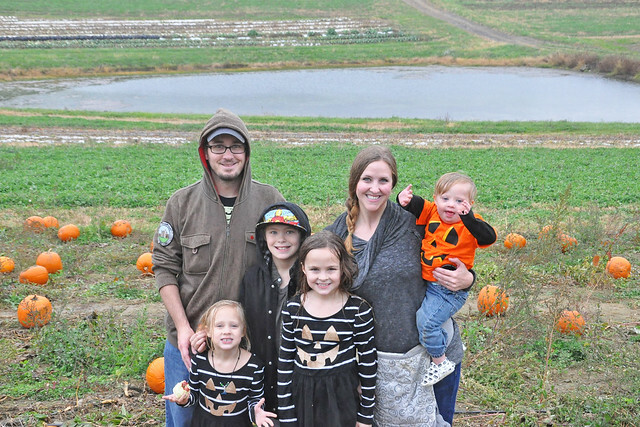 We went to the pumpkin patch on Saturday. It was rainy, but we still had fun! 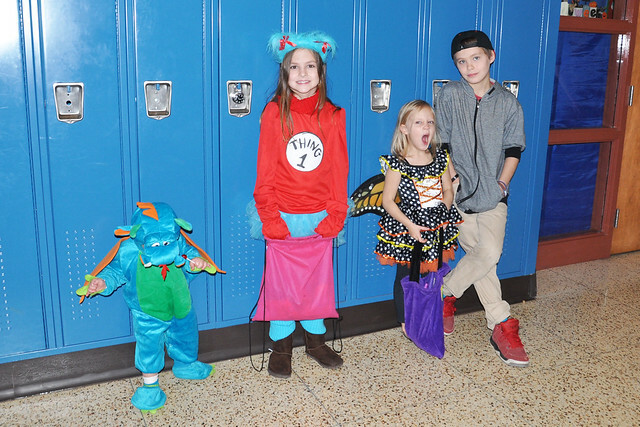 On Monday, we went Trick or Treating at our local High School. It's always so crowded, but the kids get a ton of candy! 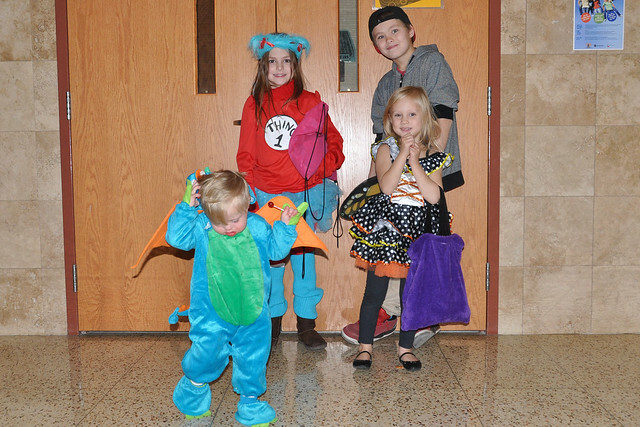 This was the first year Dylan was too old to go, so he took pictures for me and helped Lily and Liam Trick or Treat. I guess I could say the amount of money I'm going to spend for Christmas, but I'm expecting that! 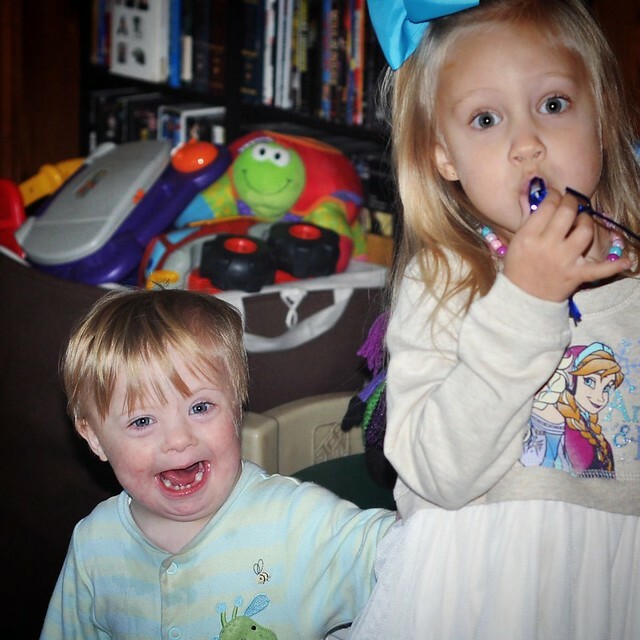 If we're looking at the big picture, I'm dreading Liam going to preschool next year and Lily going to Kindergarten. I'm going to miss Phase Two so much! 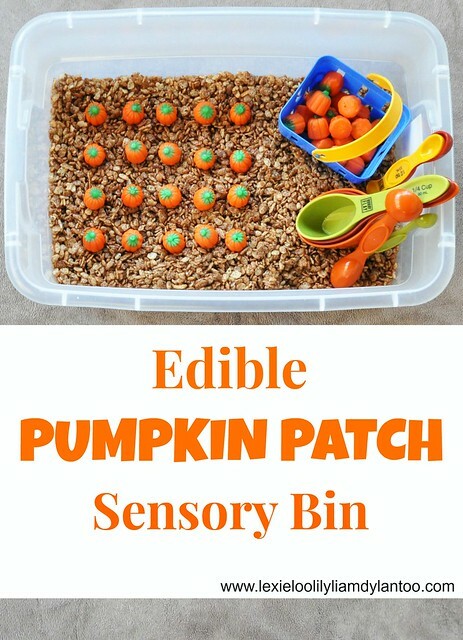 I shared our Edible Pumpkin Patch Sensory Bin yesterday, but I'm currently working on a few more fun ideas. I can't wait to share! 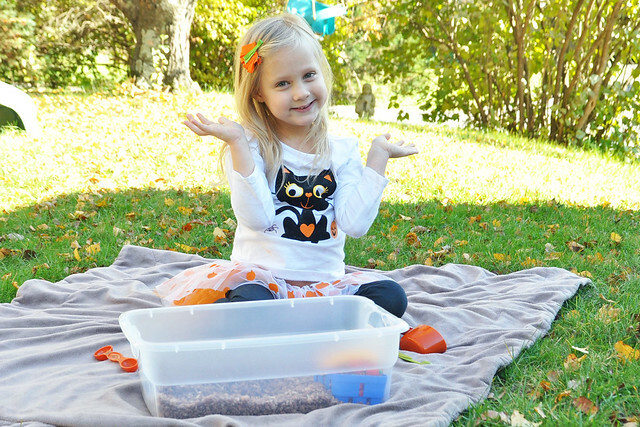 Halloween (Please don't rain! ), the birth of my great niece, Dylan's Birthday, Thanksgiving, and Christmas! This time of year is so busy for us, but so much fun! 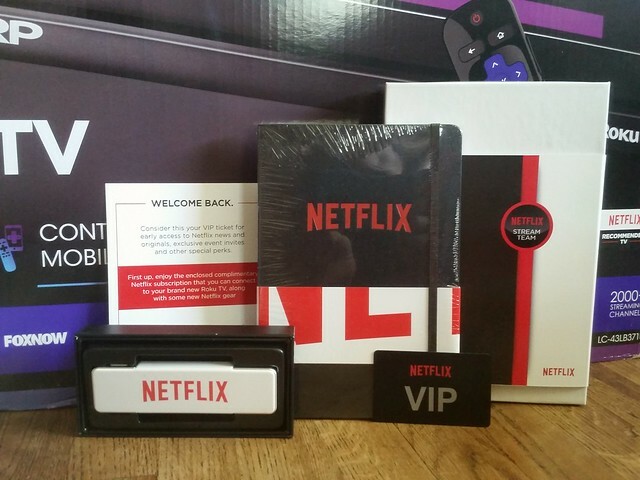 Thanks to year two beginning on the Netflix StreamTeam, and the new 43 inch TV they sent me that now resides in my bedroom, lots and lots of Netflix!!! Have I mentioned how much I love Netflix?!? We're currently streaming Gilmore Girls (5th time through!) and Hemlock Grove Season Three. We also have Family Movie Night once a week. 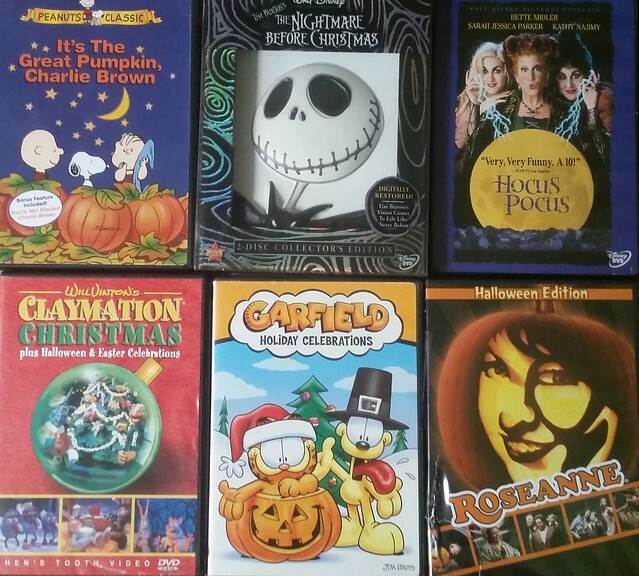 This month, we focused on Halloween movies. Our personal favorite is Hocus Pocus, but Dylan and Lexie are loving the Roseanne Halloween episodes, too! All I'm reading is books to my kids right now. 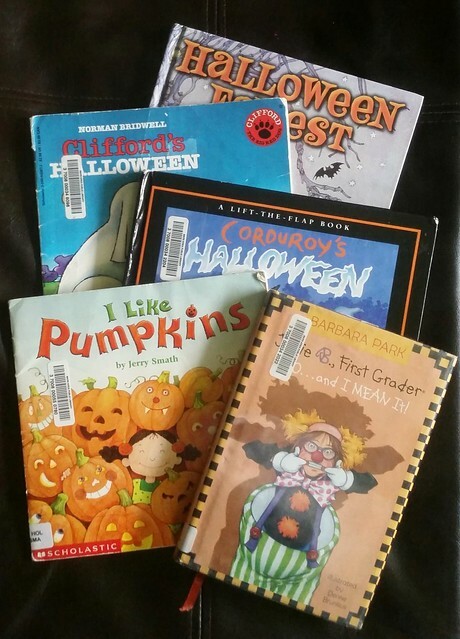 We have a bazillion Halloween books, and we added to our stash with books from the library, so we're working hard to fit them all in by Saturday! Does Jessie streaming on Netflix count?!? Thanks to my iPod crapping out on me, we're only listening to Top 40 songs during our 5,000 hours per week spent in the car. It's all my kids want to hear! 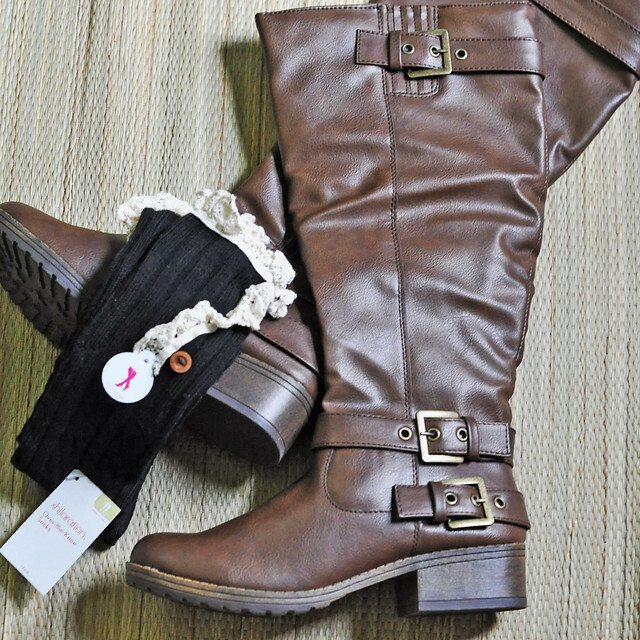 A fuzzy sweater, jeans, and my new boots and boot socks! 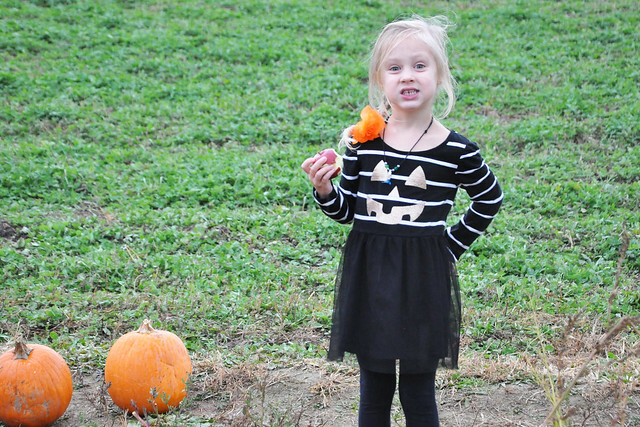 Lexie's class Halloween Party is tomorrow afternoon, Lily's class Halloween Party is Friday morning, we still have to carve our pumpkins and make Halloween cookies, and of course...Trick or Treat! Thanksgiving activities, Dylan's birthday, Thanksgiving, and decorating for Christmas! I love this time of year! In addition to our normal busyness, Dylan starts basketball at the end of November. I'm not sure how it's even possible, but our schedule is about to get even busier! Having four kids is time consuming! That just about covers it! I hope you all have a wonderful Halloween with your families!!! 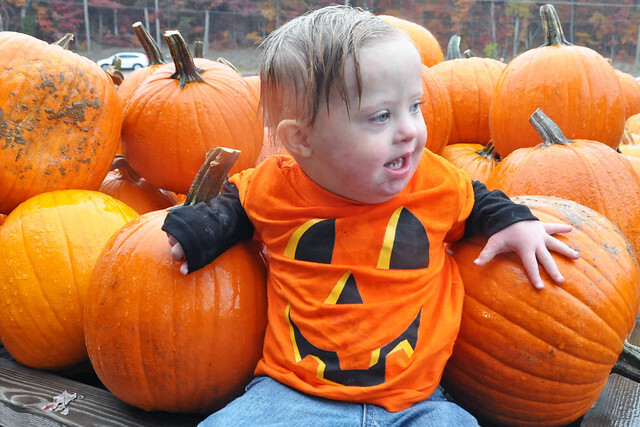 It's hard to believe Halloween is just days away! Is it just me, or is this year flying by?!? 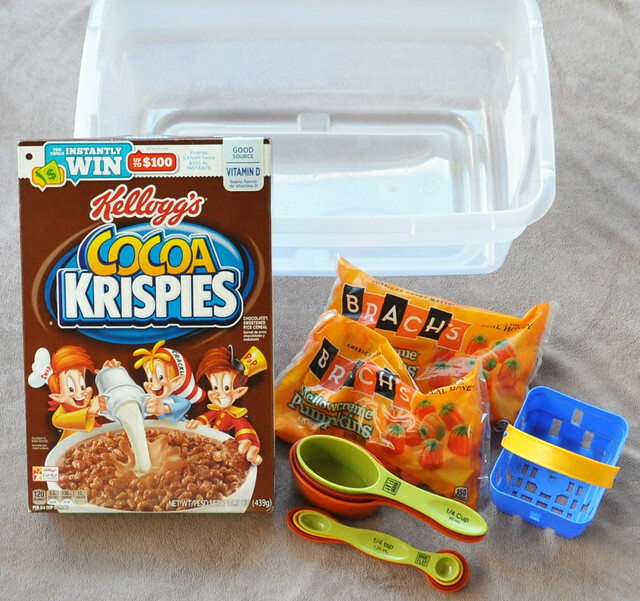 Although we do love our Netflix, I try to keep my kids busy with other activities, too! 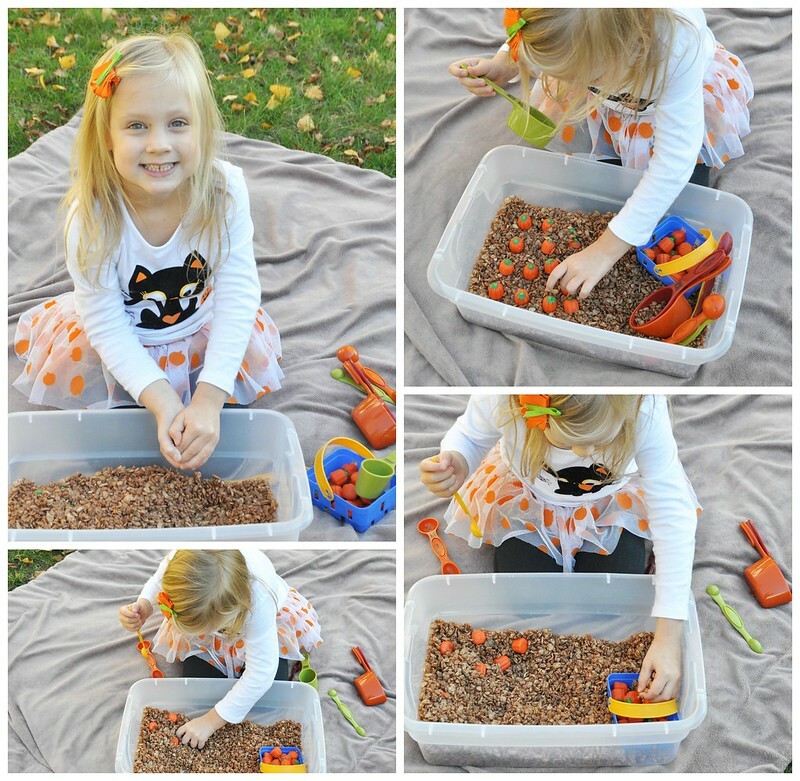 One of our frequent activities is sensory play. 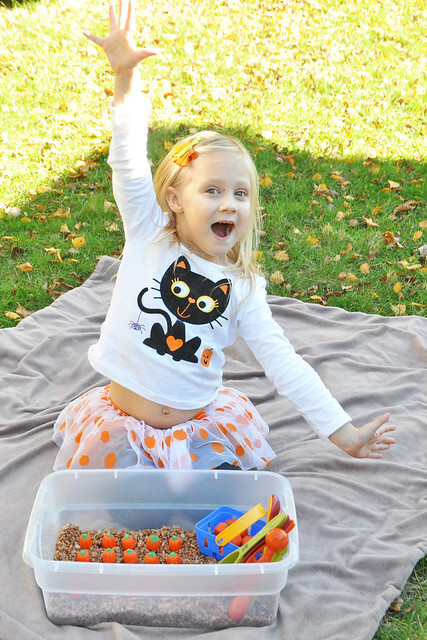 In honor of the upcoming holiday, we filled our sensory bin with some Halloween treats! 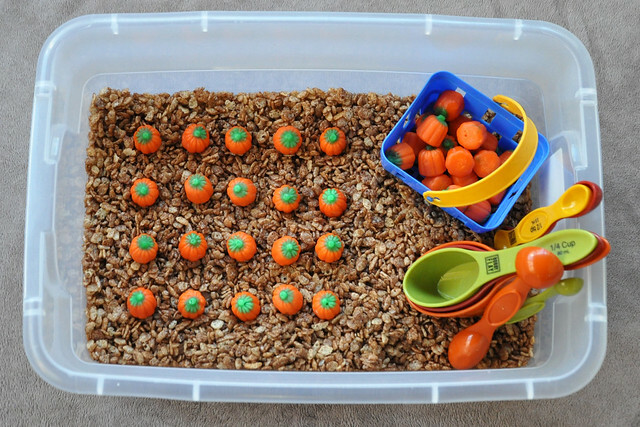 Here's our completely edible pumpkin patch! 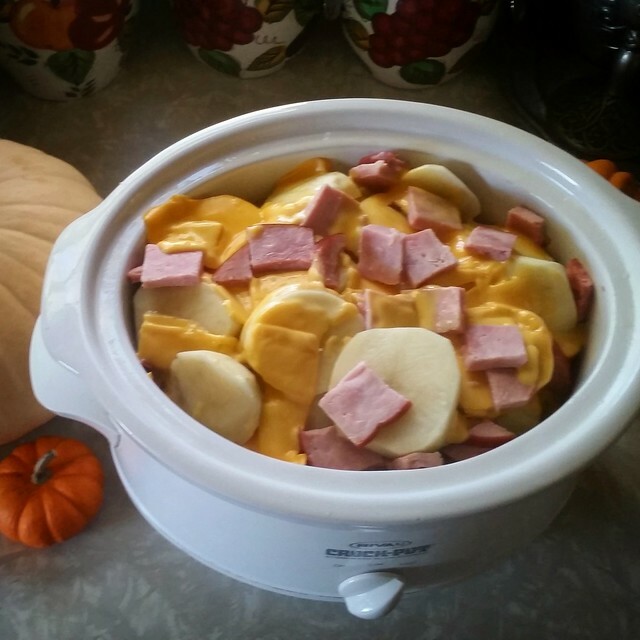 So simple, so fun, and so tasty! When I say simple, I mean simple! Setup is quick and easy! 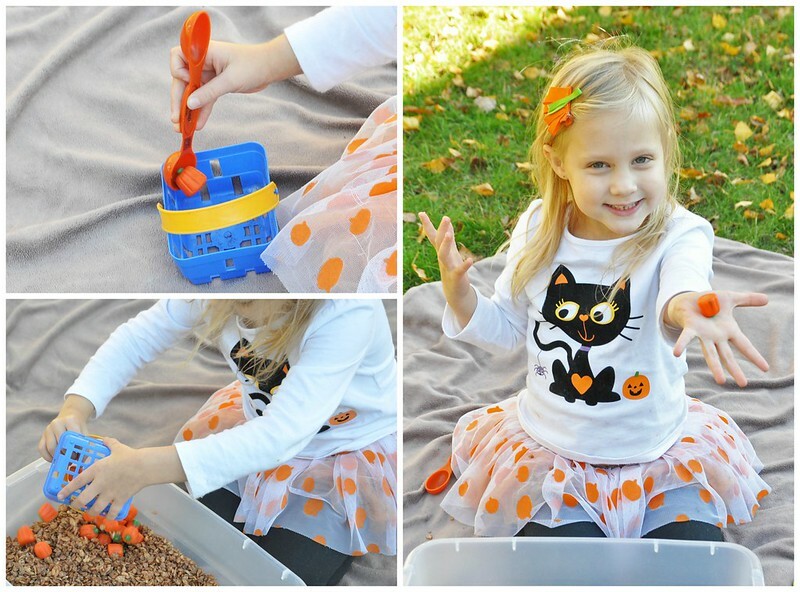 I started with a clean bin and utensils, poured in the cereal, "planted" the pumpkins, and tossed in the utensils. Lily was very eager to try it out! 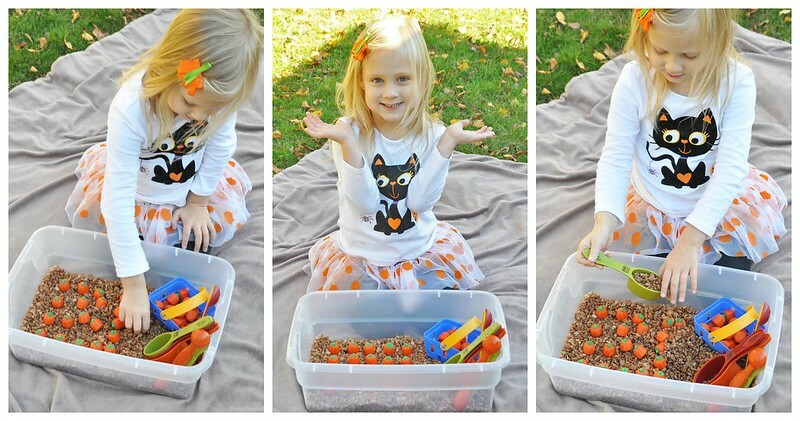 Lily LOVED this sensory bin! 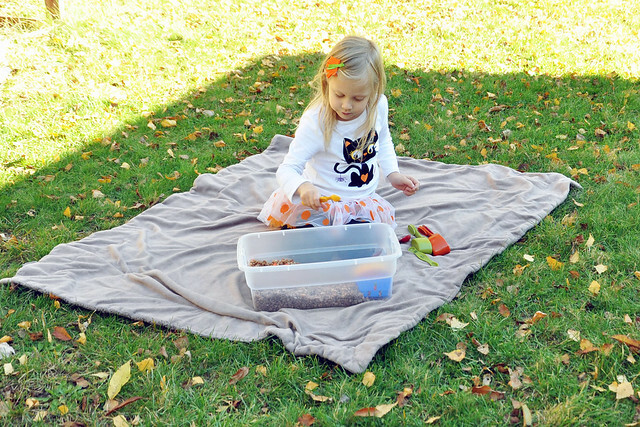 After she was done playing, we put the lid on the bin, washed the utensils, and put it aside so the other kids could play. They loved it, too! 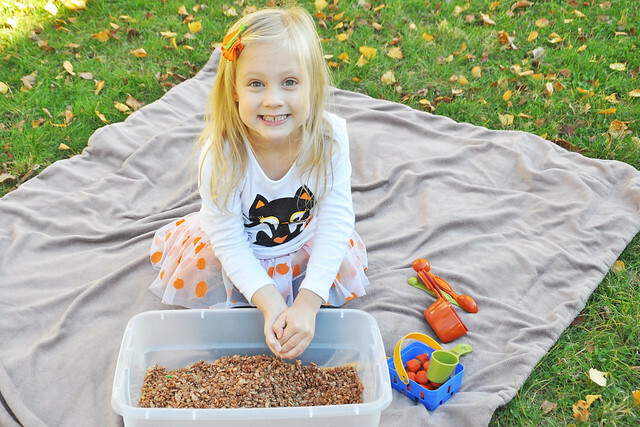 All of our sensory play activities have been a hit, but this one was, by far, the favorite! 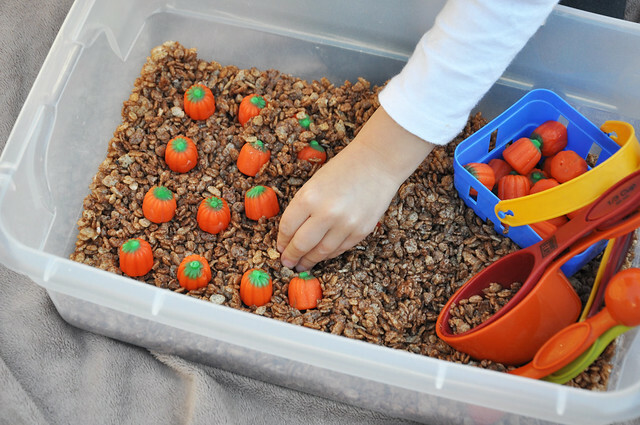 All the scooping and pouring and planting and picking was fun, but snacking on cereal and candy pumpkins made it even better! 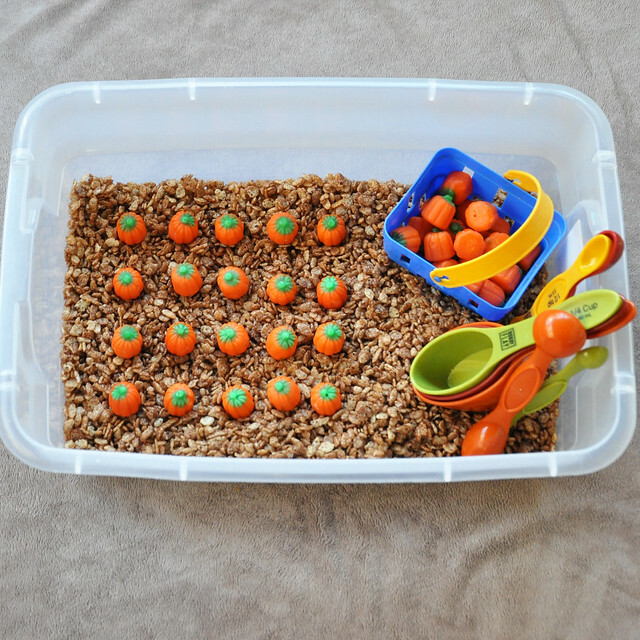 What are your favorite sensory bin activities? 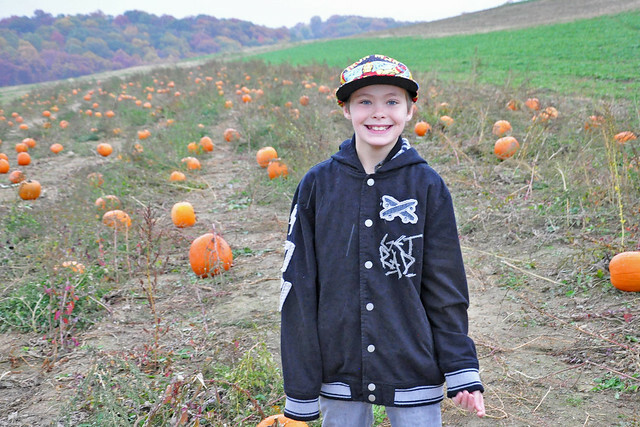 Halloween just isn't complete without a trip to the Pumpkin Patch! 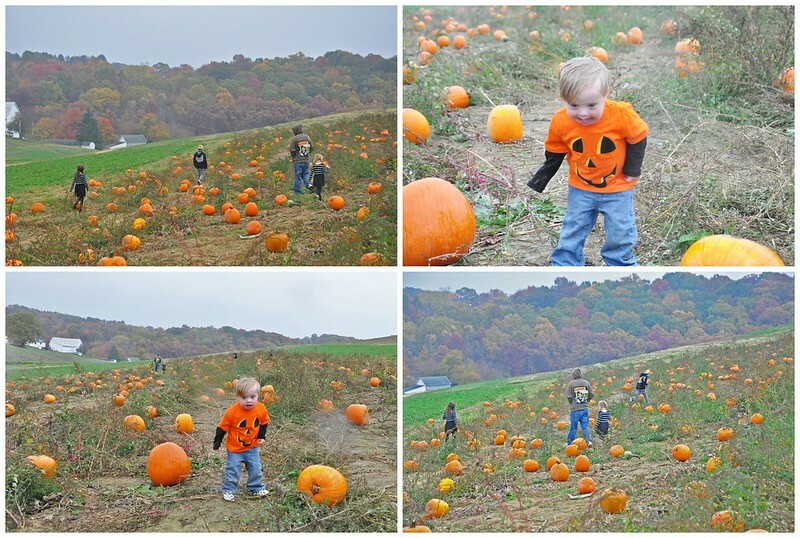 As usual, our October was SO busy that our pumpkin patch trip had to wait until the last weekend before Halloween. The weather was looking very questionable on Saturday afternoon, but we decided to take a chance. It was supposed to rain a lot that evening, and we really didn't want to deal with all the mud the following day. Of course it started drizzling JUST as we turned into the parking lot! 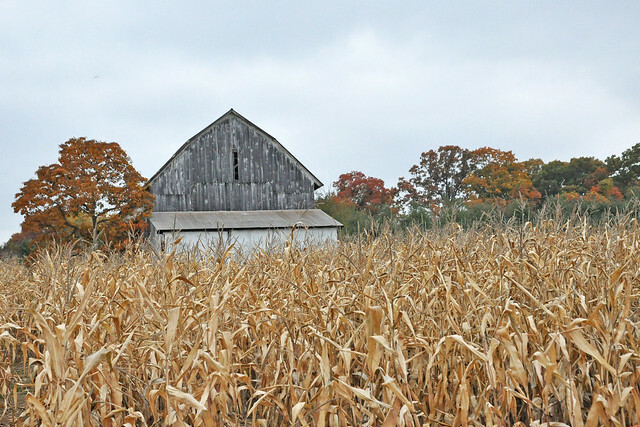 Thankfully, the weather kept most of the crowd away from the farm. 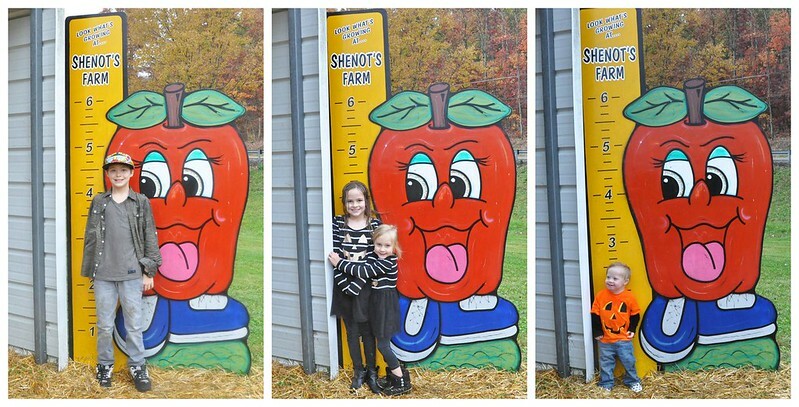 Instead of our usual wait in line for the wagon ride up to the pumpkin patch, we were able to board immediately! 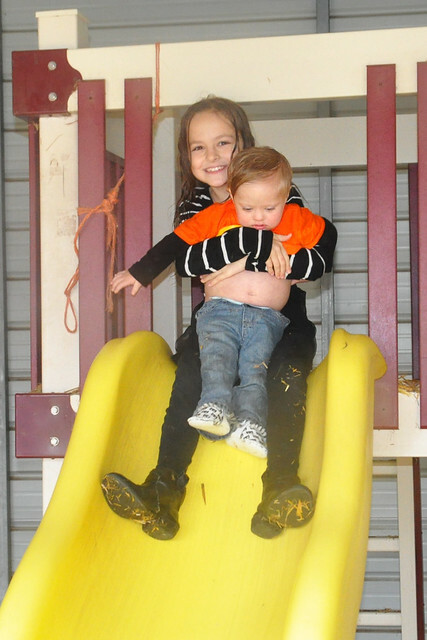 It was a very bumpy ride up to the pumpkin patch. 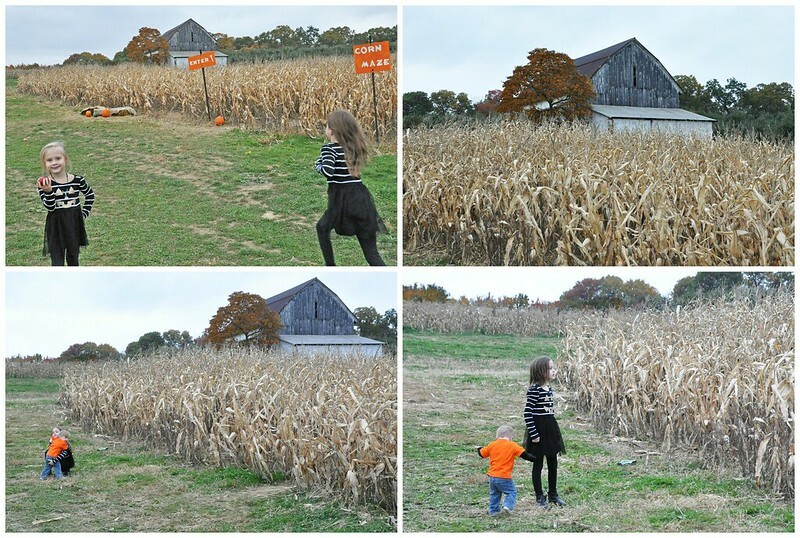 As soon as we arrived, the kids took off for the corn maze. We couldn't even keep up with them! 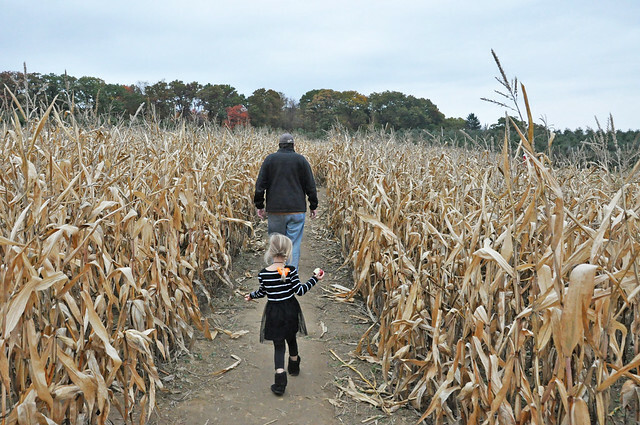 As we were finding our way through the corn maze, it started to rain even harder. 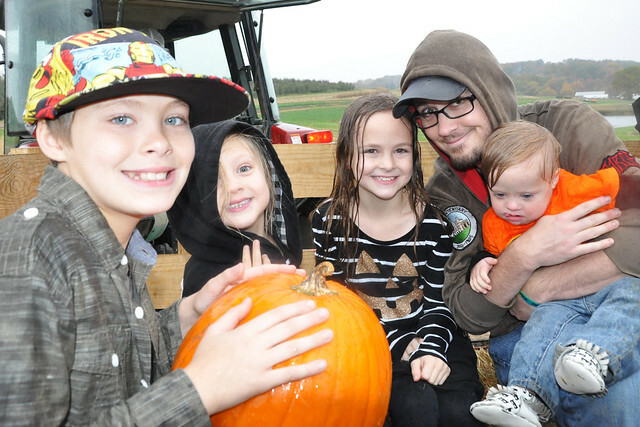 We rounded up the kids and hurried to find the perfect family pumpkin! It may have been raining, but we still had fun! I say it all the time, but it absolutely amazes me how quickly kids grow. 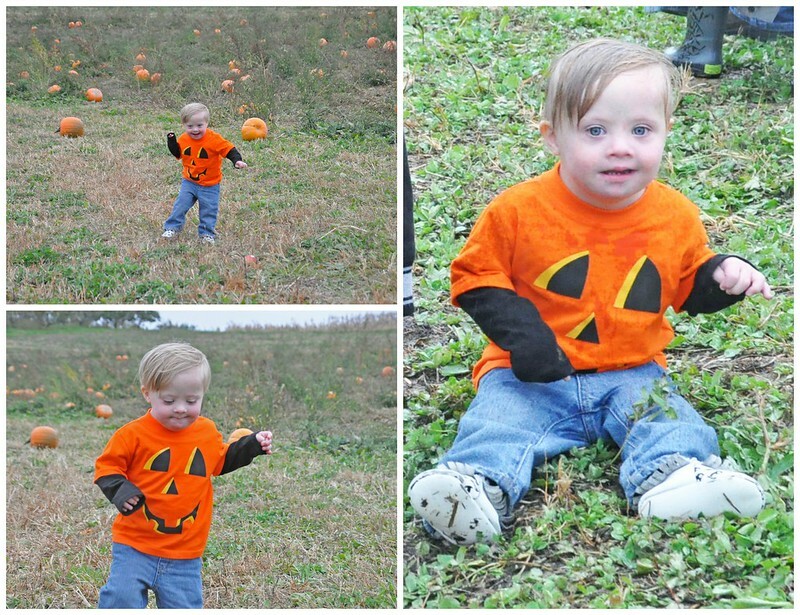 Last year, Liam was only crawling through the pumpkin patch. This year, he ran all over the place! 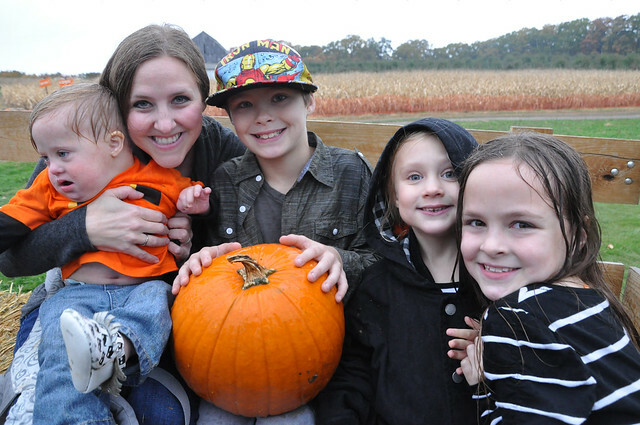 By the time we found our pumpkin, it was pouring. Liam LOVED the rain and laughed his way through it. 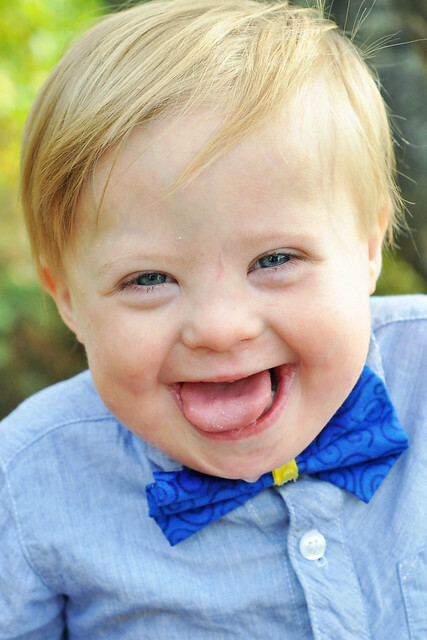 His zest for life is truly contagious. 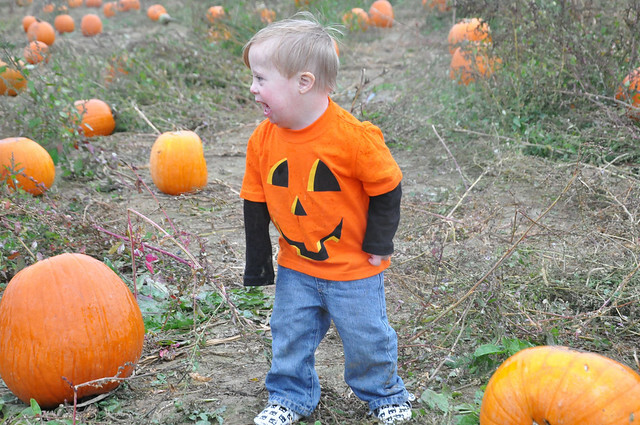 Getting stuck in the rain can make people very unhappy, but everybody in the pumpkin patch was laughing along with him! We had a bit of a wait before the wagon returned. Really, it was just a few minutes, but we got soaked! 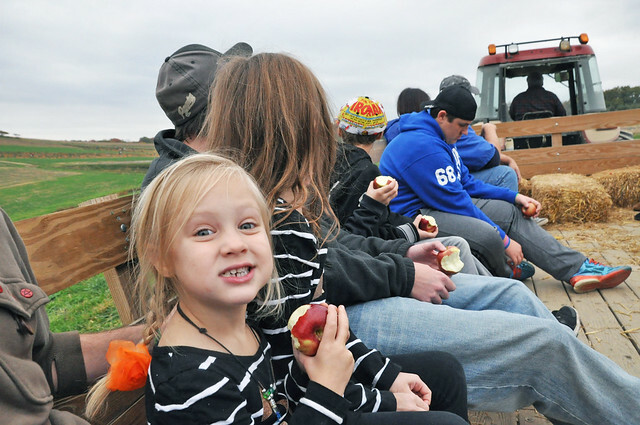 That being said, I was REALLY happy to climb aboard and head out of the pumpkin patch! 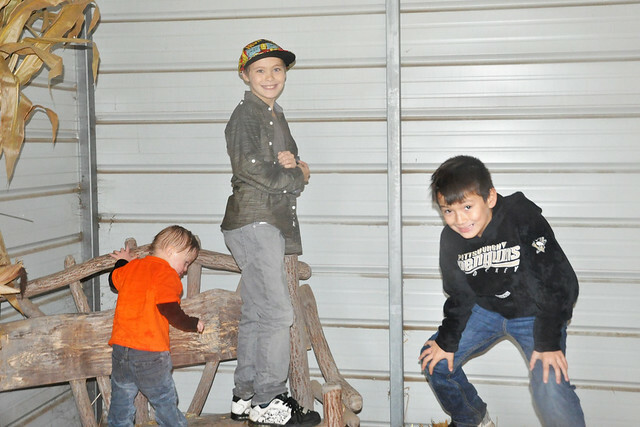 Before we left, the kids wanted to play in the straw barn. I swear, I'm going to just fill my backyard with bales of straw. They love it! 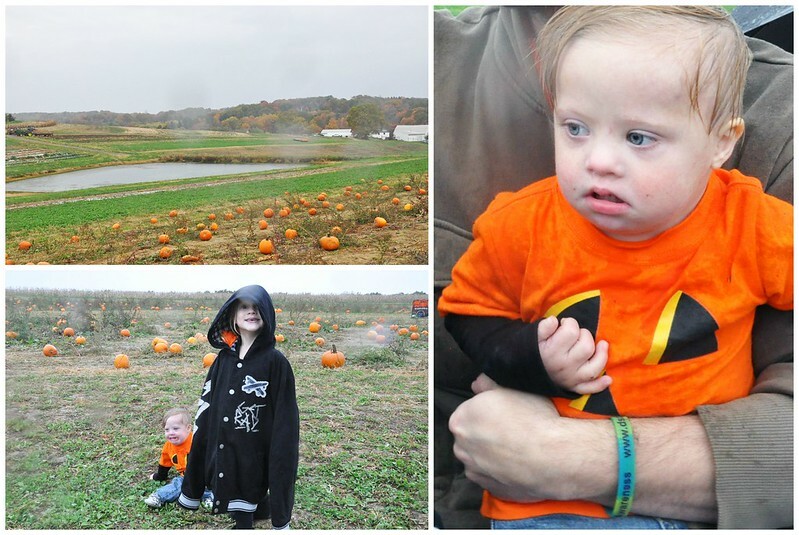 Despite the rain, we had a successful trip to the pumpkin patch! The kids had fun, and we didn't have to deal with a crowd. The trickiest part was trying to keep my camera dry and take pictures in the rain! Next time? I'll remember the raincoats and umbrellas if rain is in the forecast! 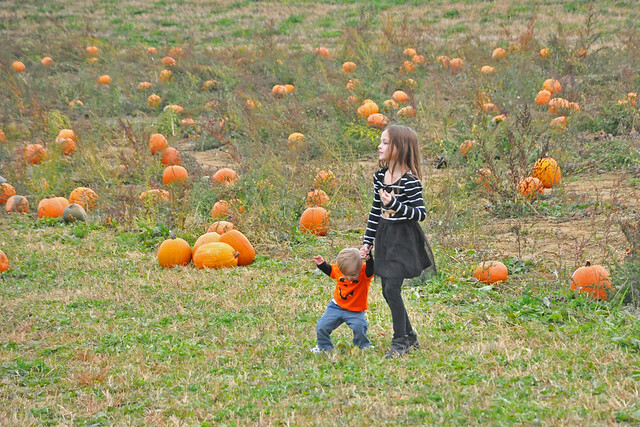 Going to the pumpkin patch is my favorite Fall tradition! This year, the rain just made it a bit more memorable! 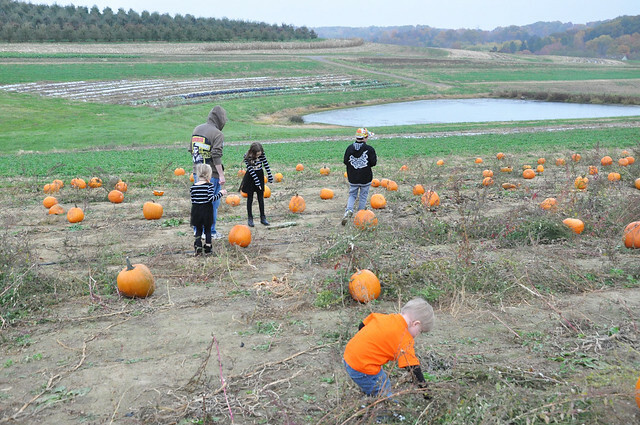 Have you visited the pumpkin patch this year? 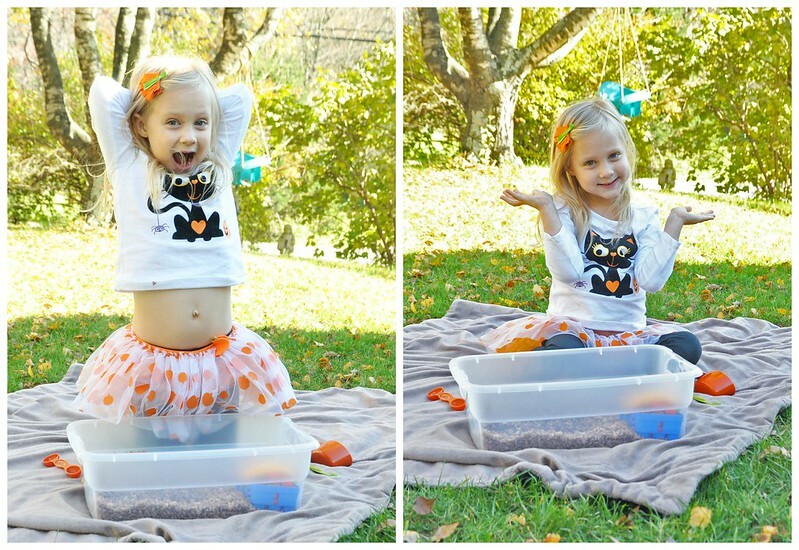 Linking up with Courtney for the Countdown to Halloween Blog Hop!